(Nanowerk News) An international collaboration led by chemists and engineers from the University of Pennsylvania has prepared a library of synthetic biomaterials that mimic cellular membranes and that show promise in targeted delivery of cancer drugs, gene therapy, proteins, imaging and diagnostic agents and cosmetics safely to the body in the emerging field called nanomedicine. 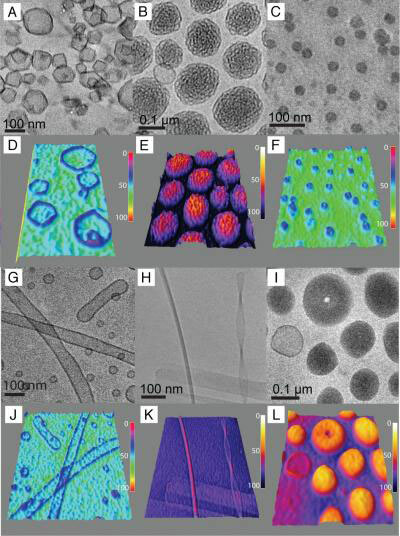 These are cryo-TEM and 3-D intensity profiles of (A and D) polygonal dendrimersomes. (B and E) Bicontinuous cubic particles co-exist with low concentration of spherical dendrimersomes. (C and F) These are micelles. (G and J) These are tubular dendrimersomes. (H and K) Rodlike, ribbon and helical micelles. (I and L) Disk-like micelles and toroids.